Hi folks, it seems I’m apologizing more and more for my lack of posting these days. I apologize for that. Things were crazy work-wise two weeks ago as I was doing my best to get all my work done before heading on vacation and then spent last week computer-less at Walt Disney World with my wife, daughter and parents. I’m back in action now, though and have plenty of food pictures to show off from our vacation! My dad and wife did a fantastic job figuring out the whole trip while also mapping out the restaurants. We went with the Disney Dining Plan, which gives each person in your party one snack, one counter service meal (basically any place where you’re not being served by a waiter) and one sit down meal per day. It worked out really well for us and I recommend giving the plan a look if you’re even remotely interested. In addition to having a lot of different options, we really enjoyed the break that a sit down meal gave us from all the park hopping. Our first meal was at a place called Big River Grille & Brewing Works on the Disney BoardWalk which was right across from our hotel room at the Beach Club. As it turned out, our flight from New York was right on time and without complication, but my parents wound up having to sit on the runway pre-takeoff for 90 minutes. As you can imagine, they were looking forward to getting some food and a drink, so Big River — which had been planned out months in advance — became an even better choice thanks to its proximity to our hotel and availability of beers brewed in house and a healthy list of cocktails. The beauty of the Dining Plan is that you can choose anything on the menu from the cheapest to the most expensive offering and it all costs the same (though it doesn’t include alcoholic beverages, just FYI). 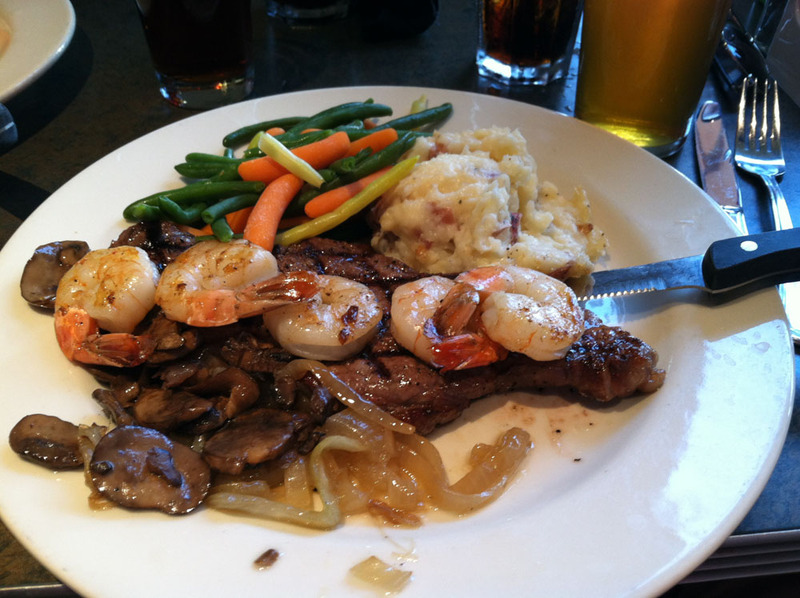 With a healthy appetite, most of us ordered the New York Strip & Shrimp Combo which is described on the menu as “Grilled 8oz. New York strip with large scampi-style shrimp, served with garlic mashed potatoes and vegetables.” I also went with a couple of the Steamboat Pale Ales which had that bitterness that all pale ales are known for, but didn’t pack that real soul-punch that some of the more intense ones feature. I’m not the biggest fan of shrimp, in fact I tend to avoid the tiny sea bugs most of the time, but figured I’d give them a shot and they were pretty good. I’m just not a big fan of that flavor/texture combination though I guess as I’m still not won over. The steak was also great, but not the best I’ve had. I think what I actually liked best about the meal was the garlic mashed potatoes, but then again, I’m a sucker for mashed taters. As far as I’m concerned, you can’t go wrong with a nice steak and some beers on a warm Florida day after doing some hefty traveling. Stay tuned here for more Disney food posts. If you’re more interested in our trip, keep an eye on Pop Poppa where I’ll be catching up on Photo Diary posts and also posting the latest episode of The Pop Poppa Nap Cast which will be all Disney!